There is a lot of interesting variation on the Guaranteed Rate Field food menu. The White Sox, like most teams, offer a lot of local iconic eats, but they also feature a few items that acknowledge the Latin community in town, like elotes, Cuban sandwiches, hot tamales and walking tacos. Here are three items worth trying at the ballpark…get your Chicago fix in and have some Latin flavor with it. Comiskey Dogs? Wasn’t that a Quentin Tarantino movie? Guaranteed Rate Field Food Tip #1: The Comiskey Dog. Well, yes. Chicago, as a city, worships the hot dog, and they have their own popular variation of it. The city is home to any number of hot dog joints, most all of which will hand you a dog cooked Chicago-style, or “dragged through the garden” as frequent Chicago visitors call it. So it follows that you have to have a Vienna Beef classic on a poppy seed roll, topped with…in order…yellow mustard, chopped onions, neon green relish, pickle spear, tomato chunks, sport peppers and celery salt. There are plenty of places to get ordinary dogs or Bobak’s sausages at Guaranteed Rate Field. 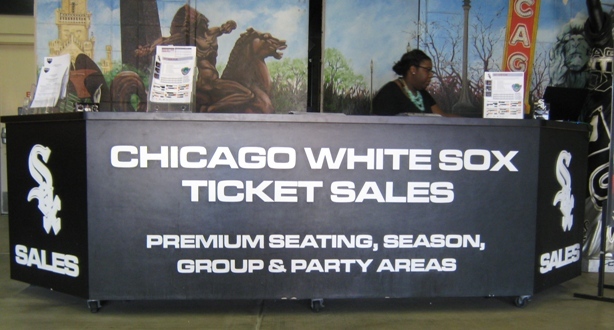 But if you want the authentic stuff from the Windy City, Comiskey Dogs has it. The Chi-town pico is a nice healthy offset to bacon on a stick. 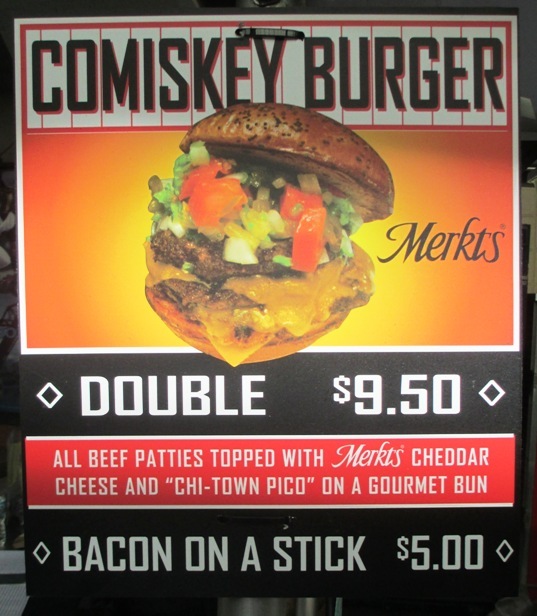 Guaranteed Rate Field Food Tip #2: The Comiskey Burger. Whoa, that was a curveball, right? Comiskey Burger? Did they even have burgers at ballparks in Comiskey’s day? Well, the idea behind the Comiskey burger is to create a burger offering that is every bit as Chicago as the Comiskey Dog, which it is…the Comiskey Burger is two decent sized patties with cheddar cheese, topped with pico de gallo and the Chicago Dog ingredients, sport peppers and all. Again, they have ordinary burgers at the rest of the stands, and you can get turkey or black bean burgers, but man, if you’re gonna get a burger, get that Chicago-style too. It’s worth the couple extra bucks. We keep the cobs and pass the savings on to you the consumer! Guaranteed Rate Field Food Tip #3: Elotes. Elotes is another word for corn off the cob…yes, off the cob. At Guaranteed Rate (I’ll never get used to that name), the shucked corn comes with a load of toppings: salt, butter, cayenne pepper, cheese, and mayo. They call it a “healthy” option…I don’t know about all that, but they’re tasty and popular here. If you’re wondering why corn off the cob isn’t just called “corn”, it’s because it’s shucked off the cob right there in front of you, as proof that it didn’t come from a can. 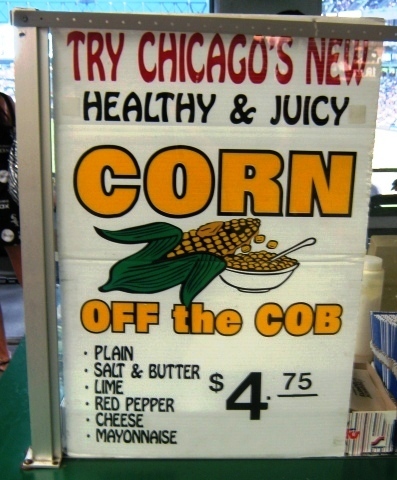 I’ve heard the White Sox wouldn’t sell actual corn cobs because of their weapon potential. But their selling of mac and cheese bites now kind of negates that theory. There you go…three Guaranteed Rate food menu items worth trying at your next Sox game. Not only are they unique to this ballpark, they’re pretty unique as variations on classics too. But there’s also the burgers at the Craft Kave, the Southside Italian beef (sandwiches), the Wok-Off noodles, and Cuban Comet sandwiches…stay tuned.